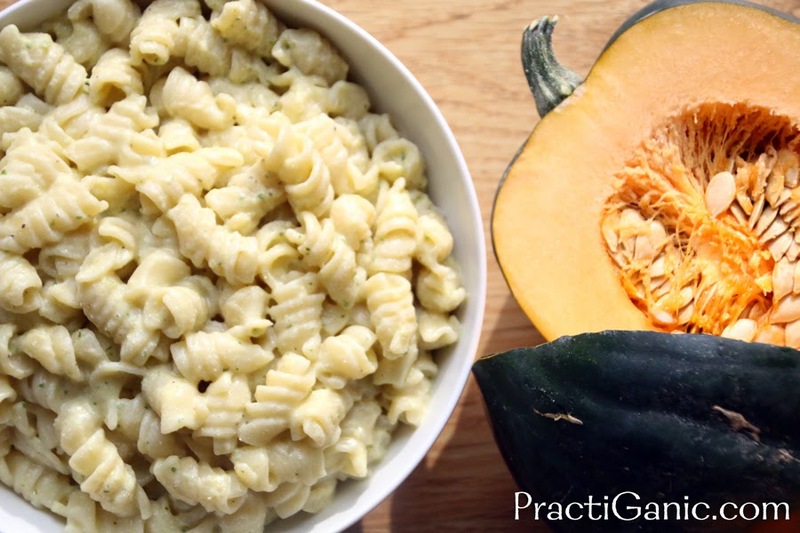 Acorn Alfredo Pasta: Best Use of Acorn Squash So Far! Is anyone surprised ... I needed a quick dinner! I decided to make Vegan Mac & Cheese but I soon realized that I didn't have any tofu. Thinking fast, I decided to use a sweet potato ... scratch that, I didn't have one of those either. Aha! 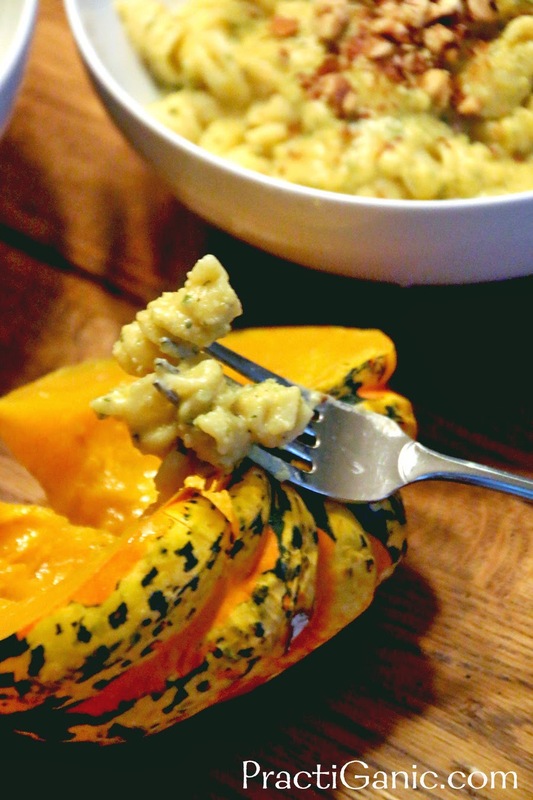 I can use my acorn squash! Now we're moving. Looking at my recipe, I couldn't do an exact substitute so I began adding and subtracting different ingredients. Once I was done and I tasted it, I realized it didn't have that Mac & Cheese flavor but more of an alfredo sauce. Fine by me! It was luckily still a big hit in the family too so I knew I could make it again. The next time I made it, I was able to get the flavor even closer to a real deal alfredo. It still amazes me that there is no dairy in it! Since Paul can't do cream sauces, it's been years since he's had an alfredo sauce and this is one that I was proud to give to him as a replacement. I didn't have acorn squash for the pictures so I used carnival squash which is equally as good. It has the same sweet mellow squash flavor that acorn does. Cut acorn squash in half and remove the seeds. Make slices in the squash with a knife and lay face down in a pan filled with 1/2 in of water. Roast them at 375º for 40-45 minutes. In a pot, add veggie broth, onion and garlic and bring to boil. Then, turn off heat and add in nutritional yeast, parsley, cashews, lemon juice, salt and pepper. Once the squash has is out of the oven, scoop out the insides and add that to the pot as well. 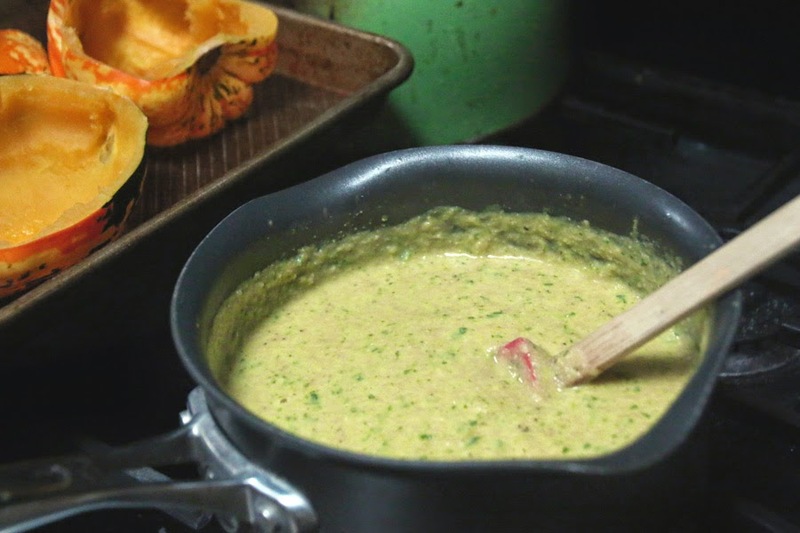 Using your immersion blender, (or a high speed blender if you don't have one) puree all the ingredients together. 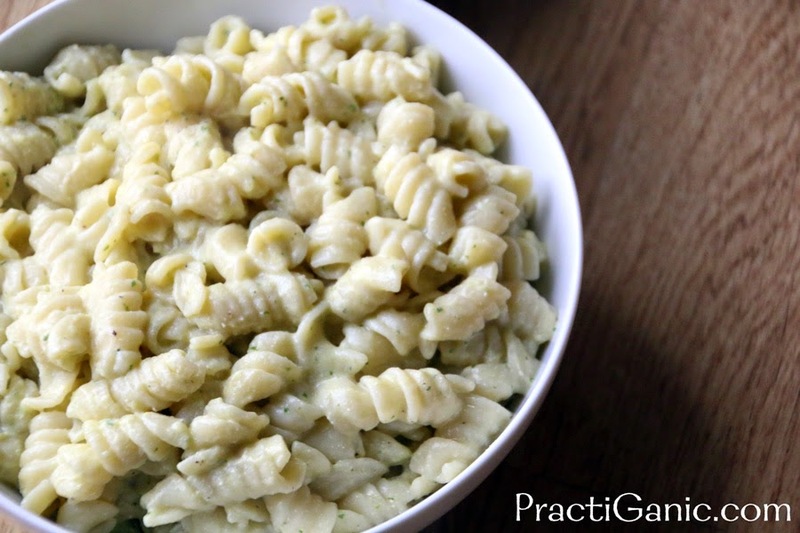 Mix your sauce and pasta together and serve. Top with walnuts.